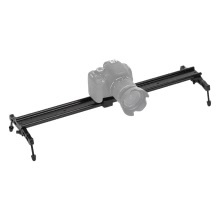 This 60cm DSLR camcorder track provides soundless, smooth and fast shooting experience. You can adjust the support foots to make fine height adjustment. Unique design makes it convenient for you to clean up the track. 60cm double-tracks rail offer soundless, smooth and fast sliding. Made of strong and durable aluminum alloy, maximum load capacity 6kg. With 1/4" screw & screw hole on the plate, and a 1/4" to 3/8" convertible screw, suitable for various camera. With 1/4" & 3/8" screw hole on the track. Height adjustable supporting foot with non-slip rubber, with built-in spirit level. Detachable plate, easy for you to clean up. Only the track is included.